Now that Memorial Day weekend is over, we’ve all got summer on our minds. If you had one summer day to spend in Bend doing whatever you wanted, what would you do? This is one of the most difficult questions I have ever had to answer. The thing is, there are multiple different ways that a day could go in Bend that I would consider “perfect.” Here’s just one scenario. Please note: all activities can be done with dog and/or beer. 1. 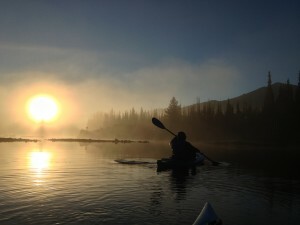 Spend the morning paddleboarding or kayaking at Sparks Lake, just 25 minutes up Century Drive from PointsWest. 2. Grab some fish tacos at Parilla Grill for lunch–trust me, they can’t be beat. Enjoy them on the deck as you people watch the other Bendites and visitors go about their perfect days. 3. Go mountain biking at Phil’s Trail. PointsWest is perfectly positioned for this–you can practically get on the trail from your own house! An afternoon ride through the forest never felt so good. 4. Catch the sunset on top of Pilot Butte. Whether you drive up or hike up, nothing compares to watching the sun set over the Cascade Range and our city. 5. End the night with dinner and brews at 10 Barrel on Galveston. World-class drinks, great food, a fire pit, and good people. There’s nothing like a summer night in Bend, Oregon.